The eight symbols that are arranged on the front and back cover of this mini album have collected different meanings along the history, from alchemical symbols, to astrological and astronomical signs. Out of the seven tracks that are found on this small collection, four are variations for the track “I’ll meet you in the caves of Thulsa Doom, baby!”, the original of which is found on their three way split, 3X3 – volume three. In these four variations, one played live and three remixes, we are offered, in a way, three abstract hybrids for the original track, each composed in a different dark experiment. With the other three tracks, we find ourselves within a haunted landscape of slow, pulsating drones, endless barren deserts and vague human traces. In space, so it seems, your screams may be well heard. The opening, redux version, of Hexerei begins with hovering, endless sounds and sonar pulse islands that create together a hypnotic, if deserted, environment. From this point the album develops with sounds that are similar to those of astronomical origin, and I wouldn’t be surprised if the eerie moments of Red Giant/White Dwarf are indeed what you would hear by listening to these interstellar entities. “Romance : The Ballad of Spiderman And The Crypt Keeper” is another short example for the ability of the Montreal Nintendo Orkestar to sound drifting in darkness, while collecting obscure sounds from infinity in order to create their sonic world. This makes me think about other albums by MNO that I have heard and to me it’s evident how these guys are evolving with each of their releases. 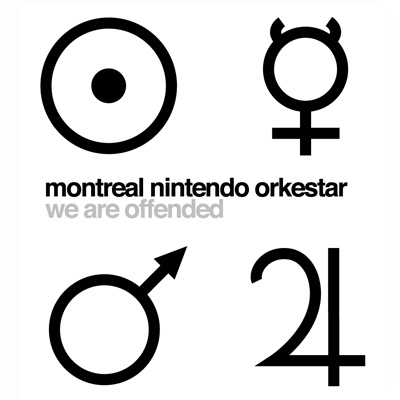 “We are offended” is no different and shows a real nice display of sounds, themes, sense of humor and intense environment.